Healthcare professionals don't need a statistical rehash of how many people head to emergency room (ERs) for non-emergency issues. We know it's a lot. Despite well-intentioned programs and initiatives to change this, the needle has been slow to move. Yes, the reasons that uninsured, transient, and other frequent healthcare fliers use the ER are complex. But they are not the only ones using it for non-urgent healthcare needs. A study by TruvenHealth showed that 71% of emergency room visits made by patients with employer-sponsored insurance coverage were for non-emergency causes. And here's another eye popper: New York State analyzed a year's worth of 2+ million claims and found that 9 out of 10 were for “potentially preventable” reasons such as sinus infections and sore throats (305,015 visits), headaches (135,450 visits), urinary tract infections (127,051), and ear infections (84,825 visits). Halting 100% of non-emergent conditions from hitting the ER is not a realistic, short-term goal. But there are a number of quick hits that can result in positive change. So instead of trying to fix the entire problem, just start fixing the problem. Consider these back to basics education and marketing tactics and the integration of a patient care technologies. I often hear physicians say, "If only the patient would have called me first, he could have avoided that ER visit." There may be multiple reasons for this, but the point is we need to retrain patients to call their physician first. Don’t assume patients know to call their physician, or realize that it's ok to "bother" him or her after hours. And don’t assume that telling people once will get results. This is a culture shift, especially for those already using the ER frequently. This campaign has to be visible everywhere, and ongoing, if it's going to make a difference. Put signs in the ER, physician waiting rooms, on the patient portal. Reiterate your "MD before ER" campaign by instructing people that, unless they are having a heart attack or bleeding profusely for example, they should always call their doctor before heading to the ER. Make the handout available everywhere in the community, from the hospital/health system web site, ER, physician offices, and retail clinics to libraries, senior and community centers, and schools. For instance, a post-operative wound care handout could include instructions for changing a dressing, a list of specific issues that are normal or require a call to the doctor or are are life-threatening - and what to do if you experience them. Be specific: “If your child’s fever is up to 104 degrees and he/she is calm/playful, call your pediatrician. If it’s 105 degrees and/or your child is lethargic, take him/her to the ER." It might also include instructions that encourage use of your system's secure texting system by telling patients to send a photo of their wound if they are concerned. People under 40 may or may not run across your educational handout. For them, there’s an app for that. 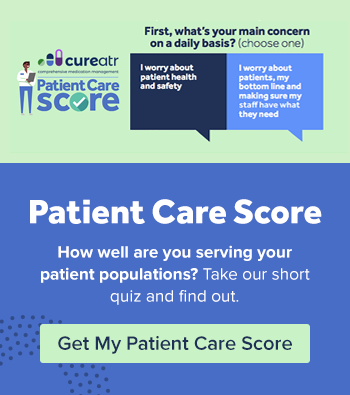 Advances in artificial intelligence are driving the development of exciting and useful personal health guide apps that help people determine, based on a series of smart triage questions that are relevant for demographics they enter, whether an ER visit is the best choice. 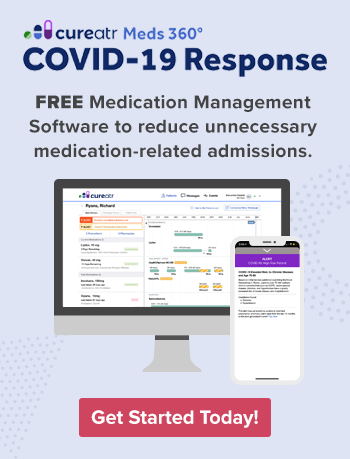 Check out ADA and Your.MD, both of which are free and have easy to understand decision tree interfaces that guide the patient using logic based on their personal demographics and health information. Every guided interaction with the app results in a report that can be sent or printed for provider review. Whether you have a DIY platform or have engaged a company such as American Well or MDLive, promoting the 24/7 access to a physician from the comfort of home, after hours, is an effective way to stave off ER visits that aren’t real emergencies. Put your marketing department to work: you need a strategy that tells people multiple ways in multiple media about the telehealth option, as well as information about what is appropriate for a telehealth visit. Provide handouts at discharge, in the ER, and in doctor's offices that provide this information and how to access a telehealth physician. 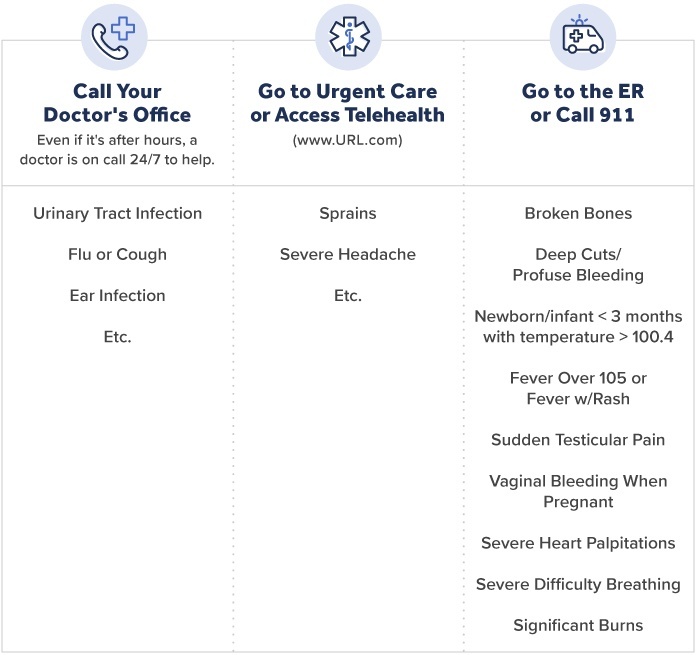 Generate a report of those who have been in the ER four or more times in the last 12 months and reach out to get these education and triage tools into their hands. Assign a care manager or social worker to be a point person for app support for those patients that need a little extra hand holding, or for those who need to hear the same educational message several times in order follow up.